I just love baby mittens because they keep newborns from scratching their faces during sleep. 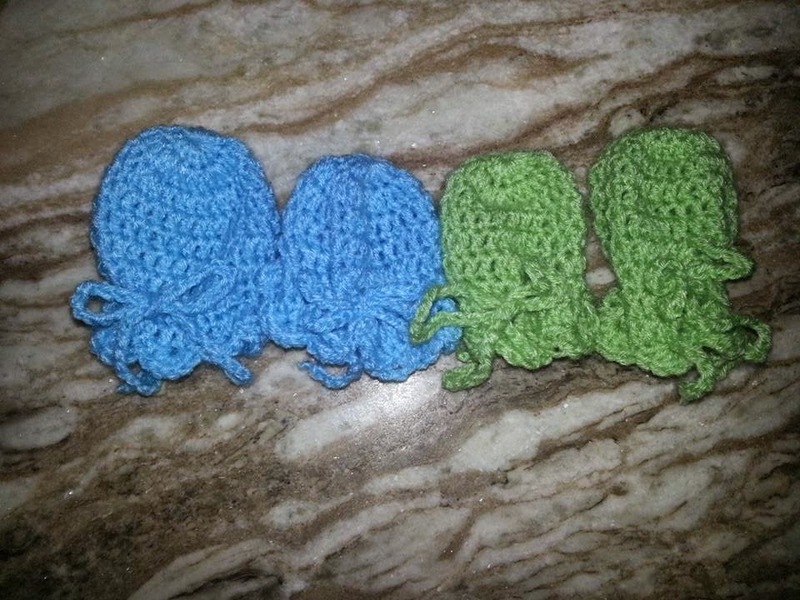 I always love including these mittens in a set for new mommies! They are super quick to work-up and are easy skill level. I suggest for a more tight look and no top holes showing to begin with a Magic Circle. Try learning the Magic Circle from the following YouTube Video. It is very difficult to learn it from a readable tutorial, it is an art you must see first hand. In my opinion, I think of a Magic Circle as a slip knot that has not been closed. You just start your stitching right away in the slip knot instead of doing a chain circle! Yarn: Please note I am located in India and yarns are very different than in UK and USA. We go by ply and I always give my best estimate of what weight to use in other parts of the world. For this project I used Vardhman Baby Soft 2-3ply yarn. In UK/US it would be a baby weight yarn. Weight: I used about 5 grams of yarn for both mittens. 1. Begin with Magic Circle and chain 3, then 15 DC. Pull tight and start with Row 1.